An imaginarily perfect garden, or a real life one? You could be forgiven for thinking this was one of those ‘imaginary’ gardens. You know, the impossibly perfect ones you see on Pinterest – with no mention of location or designer – that you’re slightly dubious actually exist. But this garden, designed by Michael McCoy and planted up by its wonderfully hands-on owner, really does actually exist. I saw it with my very own eyes. I confess that only half the photos here were taken by me. I put it down to ‘awestruckness’. Part awestruck with the beauty in front of me, which felt like nothing I had ever seen in Australia, and half mesmerised by Michael’s energy and story-telling of the garden’s development. I left feeling entirely exhausted. Somewhat annoyingly, Michael is not only a captivating story teller, a garden designer of immense skill and generous to a tee with his time, he also takes the most wonderful photos. He had stood in exactly the same spot at exactly the same time as me and yet come away with photos of an entirely different quality. It’s lucky he’s an inherently likeable chap. But the garden. Gosh, the garden. It’s hard to know where to start with describing why it’s so good. Perhaps we’ll start with colour. Colour’s always the thing I notice first. I sometimes worry that it shouldn’t be – that somehow, as a designer, I should have moved on from colour – but it is and I think it always will be. For me, the colours are ‘almost perfect’. Which equals ‘perfect’ in garden design land. For me ‘perfect’ is just too predictable, too staged, too unimaginative. Michael describes a few ‘aberrations’: the self sown hollyhock and the bright orange Agastache. Aberrations are a wonderful garden asset. But the colours, such a wonderful, complementary mix. Some receding, like purples, some more prominent, like the whites, pastel pinks and of course, that orange; but the whole, so much greater than the sum of the parts. The colours also have the very necessary relationship with the landscape. The straw coloured grasses that link to the typically dry fields beyond and the dark, slightly grey green foliage that ties in with the surrounding gum trees. Michael has managed to create a very lush feel with a whole mix of greens, whilst keeping the look authentic to its location and in total harmony. A priority for Michael was to achieve the right balance of height across the garden. Too much variation, and the planting won’t hang together; not enough and it becomes two dimensional and static. The Stipa gigantea are one of the most important plants here, adding translucent height and movement, without blocking vistas or appearing too solid. But the whole mix of plant forms is just magical. It’s always so tempting to put something in that’s really a little too tall or a little too short, but perfect in every other way, but real discipline has been executed here. Perennials availability in Australia is limited and highly changeable and often requires last minute substitutions, but Michael has delivered a garden here that feels entirely optimised. An initial thought I had was that the limited range of forms and textures – mostly soft, wispy, vertical accents – helped to bring the planting together so successfully. But then I noticed a random spiky Yucca thrown in and realised that the repeated Euphorbia is hardly wispy and delicate. Contrasting forms make a garden but here the contrasts are subtle; they do their job without jumping out at you and shouting the contrast. Buxus balls so effectively provide this contrast, set within a sea of soft perennials, but they have been so entirely done to death as to now appear formulaic. Many other delights for me in this garden revolve around the sense of free-will that this garden emits. It is clearly a garden, not a piece of wilderness, and yet it feels highly connected to nature. Self-sown spikes of Digitalis and Verbascum erupt from the gravel in unexpected places adding that element of spontaneity and imperfect perfection. Whilst it has few (any?) native species, the palette of chosen plants comes from similar natural environments to the one we see here. The plants love full sun and free draining soil and cope with drought well. You can count up a number of continents in their origins and yet they appear as perfectly natural garden companions. It’s a great demonstration of the fact that native microclimate is what is important to cohesion, not geographical location. And the connection to nature is further enhanced by the garden’s evolution through the seasons. When I saw it, it had that wonderful spring rush of fresh, green growth as it moved into the fullness and abundance of summer. Later it will emit the ‘I’ve-given-everything-I-can’ fally-overness of autumn and then pass through the quiet, restful, recovery time of winter. Isn’t this seasonal evolution – only observed in the non-imaginary type of garden – one of the true delights for us cool climate gardeners? Beautiful. I love it. Had it not clearly been late summer I’d have been left wondering whether this garden was in Australia or England. It does look very English, in the Oudolf way we like to do things now. If my Precipitous Bank would turn out like this I’d be very happy indeed! Your Precipitous Bank is quite daunting, on many levels! When I heard about the quantities of plants that this lady put in and the speed with which she did so, it did make me think anything was possible. I have every confidence in you! It is one of the few gardens I’ve seen that, nestled in among surrounding eucalypts but planted almost entirely with exotic perennials, still looks completely and comfortably ‘at home’. Maybe it’s the large amount of grey and grey-green foliage woven through the planting? I think that’s right. It’s one of those gardens that both surprises you with its presence but at the same time looks entirely meant to be. As I walked around it I felt very grateful; to you for having introduced me to Michael back at the fair and to Michael for the very impromptu visit! Wow! Truly inspiring….lucky you! It always amazes me how gardens such as this evoke pure joy when I see them and I am not even standing in it. Thank you for another special garden blog. Do you think Michael would sell his photos on canvas? I have the perfect wall for one. I think we probably all have a perfect wall for such beautiful photos! I’m glad you enjoyed the post; I know you asked me a long time ago to write the garden up. It’s taken me a little while with all that’s been going on, but better late than never. Your garden will look like this soon! What an inspiring garden, and it does have an Oudolf look about it. I wonder if I could get one little tiny section of my garden looking like that! It’s harder than it looks, isn’t it?! I think great will-power is part of the trick. Pulling out or moving things that aren’t quite right. Not easy to do in your own, already established, garden. Good luck though; I look forward to seeing photos of yours! How heavenly! I can see why you were awestruck, Janna. Like others I wouldn’t have guessed this was an Australian garden. I admit that I am biased towards this style of naturalistic planting, how amazing to see that it translates so well across continents. I thought you’d like it, Kate! I’m sure you could recognise all the exact cultivars of grasses too. I can’t wait to come and see your naturalist garden. Lisa told me it is fabulous, even at this time of the year! Yes, so many old grassy and perennial friends in his brilliant planting design! Great to meet Lisa, her design ethos is right p my street and I can’t wait to see the view she’s got to work with in her new place – sounds fabulous. Michael has geeat willpower, certainly, but also bravery – Verbascum can be such a thug that I have been too frightened to use it in my garden. 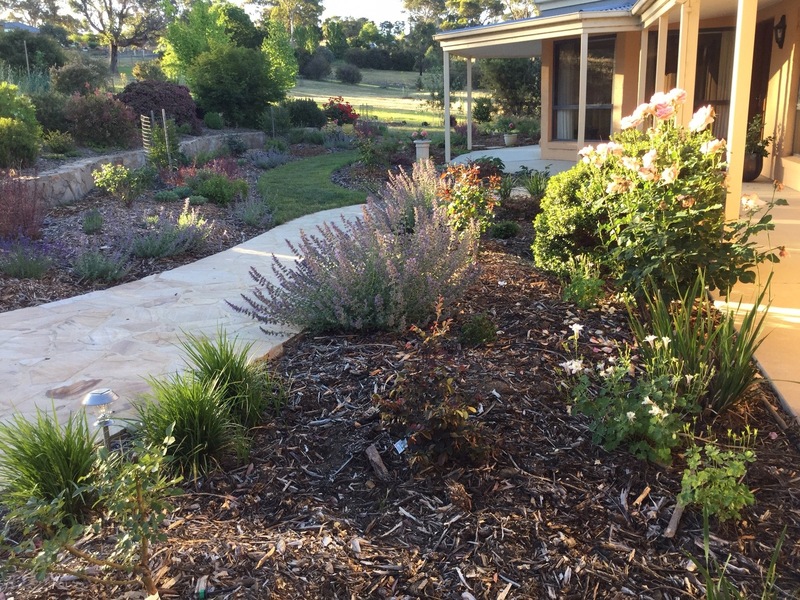 Strangely when I came home from a trip to Central Victoria to read about Michael’s garden in this post to your blog Janna, I realised we had probably driven straight past it! I wish more gardens like this we’re open to the public now and then – just the inspiration we need. I too love Michael’s garden and was very pleased to see he had overcome his aversion to Penstemons – which I remember him saying a few years back. He wasn’t overly fond of. They in the main are such tough and willing contributors to our garden, especially in the dry spells, they deserve a standing ovation. Now I wish too that I had picked up some Agastache ‘Sweet Lillico ‘ at Lambley’s on Friday when Inwas there, just the thing in front of my Calamagrostis ‘Karl Foerster’. I was thinking something lower like catmint but now your post, as always, has made me think in a new direction. 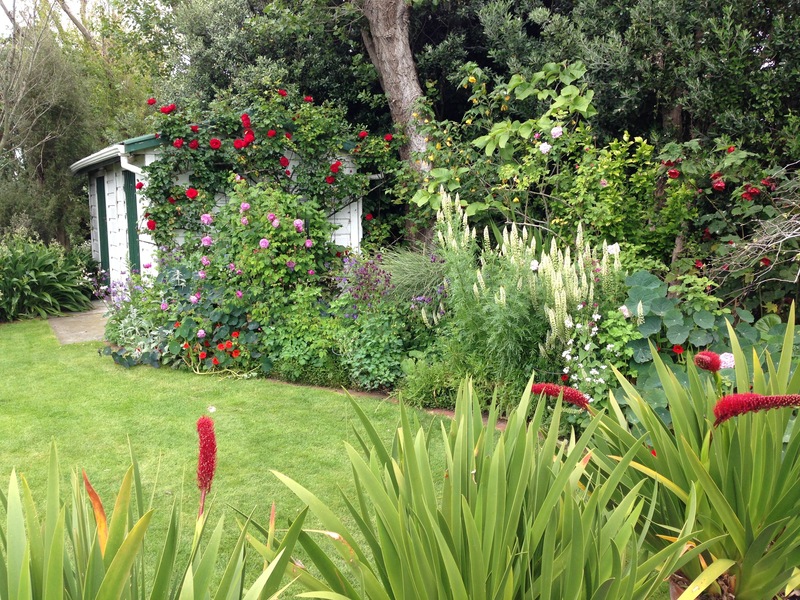 Can’t wait to get out into the garden – see how much we rely on your posts to inspire us Janna! I think Michael is still picky on his Penstemon cultivars but ‘Blackbird’ certainly earns its space here. Hope you had a great trip to Central Victoria and don’t worry about the ‘Sweet Lili’, just give them a call and get them to post you some! Oh thanks Janna. Such an enjoyable garden and so wonderfully described. Thank you for sharing this garden collaboration between Michael who is a talented designer and the wonderful ‘hands-on’ owner. A winning combination! It is beautiful, isn’t it? This winning combination is still in action too; they are working on new areas of the garden as we speak. I do hope we get to see some photos as they develop. It’s so lovely to see deeply engaged owners who really enjoy their garden to the fullest.